John E.B. Randles was an electrochemist who made important contributions to the theoretical background of cyclic voltammetry and electrochemical impedance spectroscopy. The Randles-Sevcik equation and Randles equivalent circuit are named after him. John Edward Brough Randles (b. 26th August 1912, England, d. February 13, 1998, England) was one of the founders of dynamic electrochemistry. He was educated at Derby School and Cambridge University. He was one of the two electrochemists educated in Cambridge who had a great influence on the development of electrochemistry in the second half of 20th century. Possibly his work in 1940s was better known than that of Geoffrey Barker, and so had the greater impact. John Edward Brough Randles was a lecturer at the University of Birmingham, England, and made significant contribution to theoretical bases of polarography and cyclic voltammetry. His earliest electrochemical work on the cathode ray polarograph, also called oscillopolarograph, (J.E.B. Randles, Analyst 1947, 72, 301; J.E.B. Randles, Trans. Faraday Soc. 1948, 44, 322) led to the development of linear sweep voltammetry for which he solved the problem of the current for a diffusion controlled electrode reaction by an ingenious graphical method (J.E.B. Randles, Trans. Faraday Soc. 1948, 44, 327); in particular, the equation for the peak current known as the Randles-Sevcik equation. Sevcik was the Czech scientist who obtained a similar solution by a less accurate numerical method. Later, exact solution showed that Randles’ result was sufficiently accurate for all practical purposes. His second seminal contribution to electrochemistry was in publishing (at the Faraday meeting of 1947; J.E.B. Randles, Discuss. Faraday Soc. 1947, 1, 11) an analysis of the impedance of a circuit containing not only diffusion but also interfacial electron transfer. His equation showed how to obtain i0 from an impedance -1/w1/2 plot. Randles’ publication was very influential and immediately aroused widespread interest in this type of electrode reactions, earlier work on electrode reactions having been focussed almost exclusively on the hydrogen evolution reaction. This also opened the way to the study of fast electrode reactions. The challenge of this work, together with the subsequent work on homogeneous electron transfer reactions, stimulated the theoretical development by Hush and Marcus (for which Marcus was awarded the Nobel prize in 1992), although it should be noted that these were anticipated by the qualitative picture sketched by Randles in 1952 (J.E.B. Randles, Trans. Faraday Soc. 1952, 48, 828). The equivalent circuit Randles used for the analysis of these reactions is still widely used and referred to usually as the Randles circuit, but strictly speaking it should be called the Randles-Ershler circuit – a second example of simultaneous work: a similar analysis had been published by Dolin and Erschler in Russia in 1940, but was not easily available in the West because of difficulties of communication during WWII. 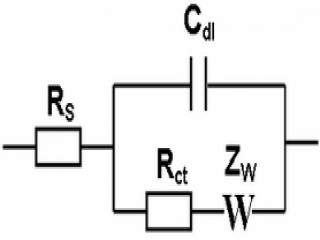 The Randles equivalent circuit is one of the simplest and most common circuit models of electrochemical impedance. It includes a solution resistance, a double layer capacitor and a charge transfer or polarization resistance. In addition to being a useful model in its own right, the Randles cell model is often the starting point for other more complex models. The equivalent circuit for the Randles cell is shown in this figure. The double layer capacity is in parallel with the impedance due to the charge transfer reaction. The Nyquist plot for a Randles cell is always a semicircle. The solution resistance can be found by reading the real axis value at the high frequency intercept. This is the intercept near the origin of the plot. The real axis value at the other (low frequency) intercept is the sum of the polarization resistance and the solution resistance. The diameter of the semicircle is therefore equal to the polarization resistance (in this case 250 W). Besides his ability to go directly to the essence of a theoretical problem, John E.B. Randles was a superb experimentalist. A notable example of this is his measurement of the Volta potential difference between mercury and an electrolyte, using the experimental method developed by Kenrick at the end of 19th century. Accurate measurement of this was achieved for the first time by Randles (J.E.B. Randles, Trans. Faraday Soc. 1956, 52, 1573), to the astonishment of the great Russian electrochemist Alexander Frumkin who had failed to obtain a stable and reproducible result. Randles published relatively few papers, but a high proportion of them are of great significance. He seemed unconcerned with public recognition, doing research because science fascinated him and he communicated this to his colleagues. He also enjoyed many other things: rock climbing, hill walking, pottery, sailing, canoeing and gardening. He lived with the children in a 16th century manor near Bromsgrove where he had a magnificent garden. The house was near the Worcester and Birmingham canal, which also passes close to the University, one of his best known exploits in those days was to canoe in to work. He retired in 1973 (in 1975 a special issue of J. Electroanal. Chem. was published in his honor) to Cornwall ostensibly to run a glass works with his son Duncan, but, in fact, to live in an old water mill which he spent much time rebuilding as well as installing a heat pump. Tiring of this and, especially of the business administration, which was never a great interest, he and his wife Jean moved to a plot of land he owned in Co. Cork. Finally, they moved back to Cornwall where, besides working a large garden, he took all the advanced mathematics courses from the Open University until he was 80; he was dissatisfied if his marks fell below 95%. It is distressing that such an active and penetrating intelligence deteriorated in the last year or two of his life. John E.B. Randles died on February 13, 1998. His wife Jean survived him together with his daughter and three sons as well as grandchildren. View the full website biography of John Edward Brough Randles.